“If I had known you were such a big fan, you could have gone for a ride in the Monkeemobile,” said the gorgeous dark-haired woman sitting next to me. The words echoed through my 50-year-old brain. 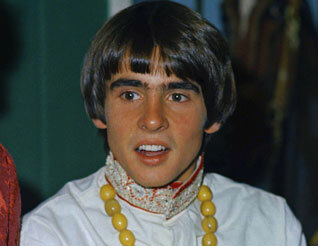 I was talking to a family friend who dated Davy Jones of The Monkees when I was a little girl. She was – and still is – one of the most beautiful women to have ever graced this planet. One of my first memories of her dates back to when I was about 7. She had come to our home with her parents and two sisters. They were all beautiful, young Armenian women; imagine the Kardashians circa 1960s. All three were pretty, but there was something special about the middle one. She was a goddess with waist-length brunette hair – an exotic Angelina Jolie – plus an abundance of class. I don’t remember exactly how old she was when I first met her, but thinking back, she must have just graduated from high school – maybe 18. She was an aspiring model with a beautiful portfolio; it was the first time I had seen real head shots. I remember them so clearly. In one, she had her luxurious dark-chocolate hair wrapped up in a towel and she was putting on eyeliner. In another, she wore a British Invasion-flavored suit – a hounds-tooth plaid jacket and hat. It was so cool. It seems like I always knew her boyfriend was Davy Jones. It was the mid-1960s and the popular television show “The Monkees” was at the top of its game. The made-for-TV band had sold more records that year than the Beatles and the Rolling Stones – and this goddess in MY living room was (as she called him) David’s girlfriend. I obviously admired her very much; add the darling English pop-idol boyfriend into the mix – and the fact that I’ve always been sadly star-struck — and I was mesmerized. I would sit at her feet as if she were my Queen, and endlessly ask her to tell me stories about how they met, their first date, their second date, their most recent date. When, as adults, I told her that I had named my childhood pet bunnies after her and Davy, she realized something that hadn’t crossed her mind when she was a love-struck teenager: that time she spent telling me stories forever made an extremely shy little girl feel very special. We both teared-up as I told her the story of meeting David when I was in my 30s. He was performing at a Teen Idol show at the Santa Cruz Beach Boardwalk alongside Peter Noone of Herman’s Hermits and Bobby Sherman – both of whom (especially Bobby, I must confess) were almost as crush-worthy as the cute Monkee. My nephews were young, maybe 8 and 12. I was living in Fresno, CA, and working at Pollstar when I first heard that David Jones was going to be performing in Santa Cruz – my favorite local vacation spot. By the time I was the age of my eldest nephew, I had outgrown The Monkees. But David will always be my first little-girl love, so when the opportunity to meet him presented itself, the 8-year-old me took over; I had to make this happen. And I did. I was going to meet Davy Jones. When we arrived at the Boardwalk, we were lead into the meet-and-greet area. And there he stood, as tiny and beautiful as ever, flanked by two tall beautiful young women, just as you would expect. He laughed – thank goodness. I shook his hand and told him that we had a mutual friend. It was a complete circle for me. “Oh my goodness, how is she?” he began. He went on to ask about her parents; sadly I had to tell him they had both passed, not unexpected however considering how many years had gone by. We comforted each other, he gave me a hug, we took some photos and went on with our lives. I told my friend – my true childhood idol – the Boardwalk story the same night I told her about the bunnies. I’m kind of crazy, I know. And well, now she knew. There they were — words that I would have died for when I was young. “They drove it to my parents house all of the time,” she added. Great. I’m almost 50 and now you tell me. Oh well, better late than never. Way better. Rest in Peace our Daydream Believer. David Jones, 66, died of an apparent heart-attack February 29, 2012. Thanks so much. It was wonderful being able to share.